It is very difficult for pedestrians to cross this junction. With no pedestrian filter walkers have to take their life in their hands to cross the road. 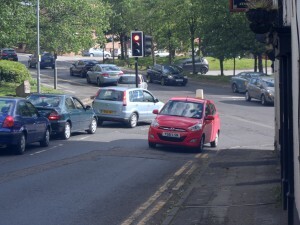 According to Crashmap.co.uk there have been 16 incidents at this junction in recent years one involving serious injury. The junction is very close to 2 Health Centres and elderly people’s accommodation. Many elderly people do not attempt to cross the road as it is too frightening for them. The Council should ensure the junction is safe for pedestrians to cross by installing pelican crossings. Please sign this petition.